Set in a post World War II Paris, An American in Paris tells the tale of US veteran Jerry (Robert Fairchild) who, after falling under the spell of a mysterious girl he sees on the streets, tears up his ticket home to try to make it as a painter in the French capital instead. He becomes friends with fellow veteran and composer Adam (David Seadon-Young) and the French Henri (Haydn Oakley), who secretly performs as a jazz singer without his family's knowledge. As the three amigos try to make a life for themselves in Paris, Jerry meets rich philanthropist Milo (Zoë Rainey) who offers to help get his art in the right places – though in return she might want more than he can give her. Especially when one of his first jobs becomes creating designs for a ballet company where he reconnects with the mysterious girl that made him decide to stay in Paris in the first place. However, while Jerry is determined to win over Lise (Leanne Cope) with his American suave, Lise has her own secrets and isn't so easily charmed by him. Inspired by the Academy Award winning film from the 1950s starring Gene Kelly and Leslie Caron as Jerry and Lise, An American in Paris is reminiscent of the golden age musicals despite only opening on Broadway for the first time in 2015. It is the instantly recognisable score of George and Ira Gershwin, combined with the romantic atmosphere of 1950s Paris from the impressive interior of Galeries Lafayette to a rendezvous on the picturesque bank of the the Seine, that make this an instant classic along the lines of Singin' in the Rain and Top Hat. And what makes this show completely unique and exciting in its own right is its fusion of musical theatre and ballet, unlike any other I've ever seen on stage. A large part of the story takes place during rehearsals for a ballet and its grand finale is a nearly 20-minute long showstopper incorporating this style of dance not often seen in musicals. Even the character of Jerry, while not being a physical part of the ballet, has a certain grace to his movements throughout before showing his incredible talent in a dream-like sequence. Robert Fairchild, who portrays Jerry, is a classically trained ballet dancer who previously was the principal dancer for the New York City Ballet. His musical theatre debut was as recent as 2015, when he opened An American in Paris on Broadway before bringing the show to London. Leanne Cope, who plays Lise, is also a ballet dancer who made her Broadway debut in An American in Paris – and it's incredible to see both performers not only shine during the dance sequences, as could be expected, but also as actors and singers. Were it not for the programme, I would've never guessed they weren't traditional musical theatre performers. The rest of the cast is made up of a mixture of musical theatre actors and ballet dancers, and the ensemble numbers are really rather spectacular because of this. As someone who sees a lot of musicals but very little ballet, there was so much to discover and be in awe by, it was a wonderful journey – all with the backdrop of classic Gershwin tunes such as I Got Rhythm, 'S Wonderful and I've Got Beginner's Luck. Special mention must also go to Haydn Oakley (The Book of Mormon, ENO's Sunset Boulevard) who as Henri provided the comedy to balance the somewhat soppy romance at the heart of the show, not to mention that he had a killer voice too and any song he was a part of was an instant joy to listen to. 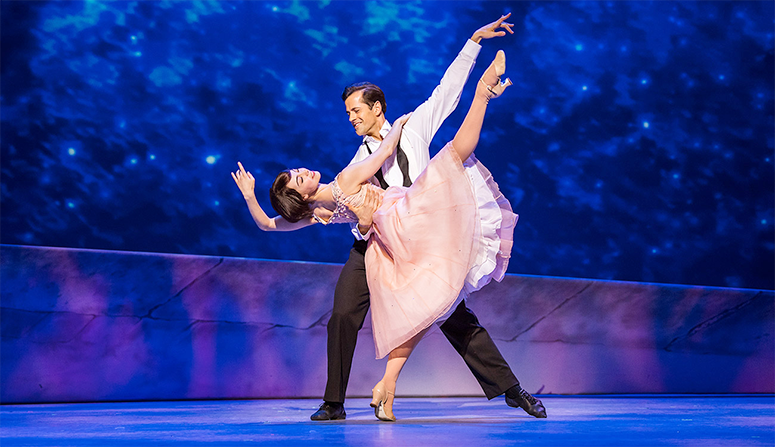 An American in Paris explores the boundaries of theatre in an exciting and contemporary way, yet manages to feel very classical making it appealing to both younger audiences and traditionalists. The romance might just be a tad predictable, but this isn't a musical you necessarily watch for the story. This is one you go to to feel the incredible music come alive on stage, to become a part of a very unique experience, and to appreciate the immense talent of the cast – especially in the elaborately choreographed sequences. You won't find anything in the West End quite like it and that is what makes this a must-see, whether you like musicals, ballet, or simply a memorable night out at the theatre. *My review first appeared on Theatre South East. An American in Paris is playing at the Dominion Theatre. You can visit the official website for ticketing information.